My kids are so excited for Halloween... And I am so dreading getting all of my end-of-marking-period progress notes in! Thus, we've been keeping it simple in the speech/language room this week. Enjoy these simple Halloween & fall themed ideas in your sessions. 1. Fall themed barrier game: Targets expressive and receptive language: use and understanding of positional terms/prepositions, following directions, seasonal vocabulary concepts. Download: Available on my Google Docs! Set up: Print out two sets of these pictures, cut and laminate. 2. Coloring pages/student generated data sheet: Reinforcement for any speech or language targets. Set-up: Print in black and white, one copy per student or pair of students. Directions: Children take turns rolling dice. Use number shown on dice as the number of repetitions required. After the student completes repetitions, he or she colors in corresponding number of spaces on coloring page. To add some self-reflection, instruct students to use a certain color for correct productions and another color for those needing more practice. For your counting convenience, the pumpkin has 50 total spots, and the leas has 40. *I found these ideas on Pinterest, but the links are broken! If you know the original sources, please let me know so I can give credit. 3. 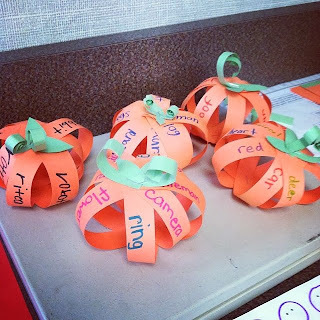 Articulation pumpkins and sound spiders: Reinforcement for any speech or language targets. 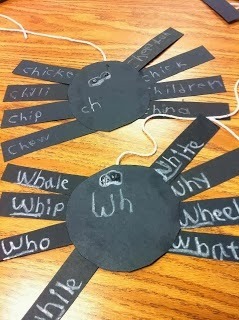 Directions: For articulation spiders: If using pictures of targets, glue one to each leg. If using white crayons, have each student write on of their articulation target words on each leg. 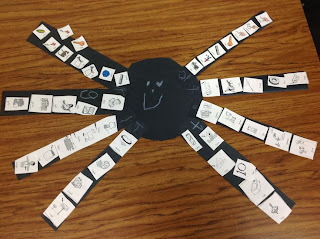 Student practices targets eight times each (spiders have eight legs, after all!). For articulation pumpkins: Student write target sound on leaf. Student writes one word with their target sound (I've been using their sight word/spelling word lists) on each orange strip. Then, flip the starburst over and tape up the strips to form a pumpkin. Again, referral to tutorial if this is confusing! Glue or tape the leaf to the top. For language targets, just adjust to fit needs - You could use these crafts for sequencing, synonyms/antonyms, adjective generation, etc.